Paris - Crash victim Valentino Rossi was confirmed as a non-starter for this weekend's San Marino MotoGP, his Yamaha team announced on Monday. The Italian nine-time world champion is recovering from a broken leg after a training crash last week. The 38-year-old motorcycling legend underwent surgery in Ancona in Italy on Friday, discharging himself from hospital the following day. His Yamaha team said it "regrets to report that Valentino Rossi will not be able to compete" in the 13th race of the 2017 season. Rossi's enforced absence leaves his teammate Maverick Vinales to fly the Movistar Yamaha team's flag in San Marino. Vinales is placed third in the world title race on 170 points, 13 behind Ducati leader Andrea Dovizioso. Rossi, who is placed fourth on 157 points, is facing a race against time to be fit for the following race in Spain on September 24. 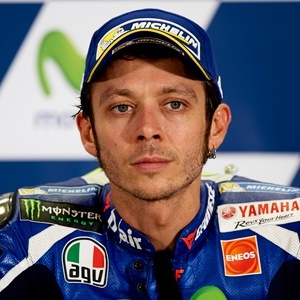 On leaving hospital Rossi vowed to get back on his bike as quickly as possible. "I will begin the rehabilitation as soon as possible and we'll see how my body reacts before making any decisions," he said. "It will depend a lot on him but I think that he will have to rest at least 40 days," Dr. Raffaele Pascarella, who carried out the surgery, suggested on Friday.